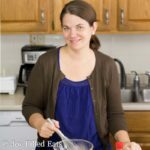 This is my first ever guest post and I’m so excited. 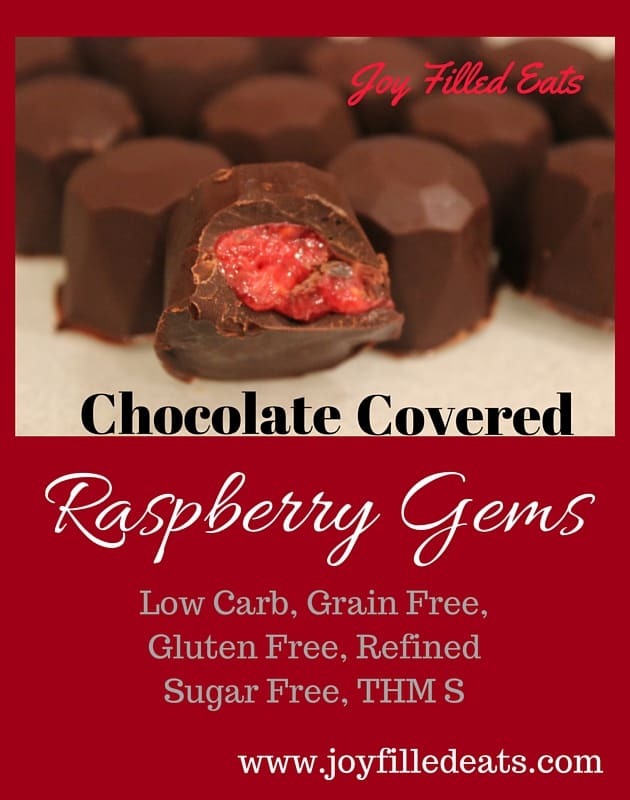 When I saw Johnna’s recipe on Facebook about her Chocolate Raspberry Gems I knew I wanted to share it with you. Luckily she was happy to let me post it here at Joy Filled Eats. These are made with fresh raspberries and sugar free chocolate. 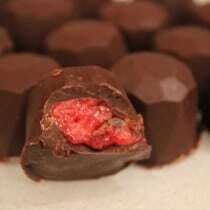 They are beautiful with red raspberry filling peeking out from the layer of chocolate. 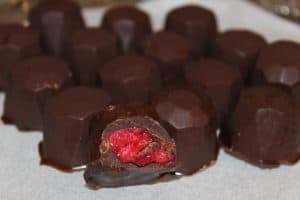 They are not the cheapest treat to make but when you compare making a batch of these to spending $40 a pound (for non diet friendly options) at a fancy chocolate boutique they don’t seem so expensive. I’m planning on making a batch for Easter with 85% dark chocolate since I ordered a case of ten bars from Amazon recently. I may add a bit of sweetener when I melt down my dark chocolate so it isn’t too bitter for my kids. I also need to order the diamond shaped silicone mold still. I’m thankful pretty often for two day Prime shipping. If you use any of my links to iherb you save $5 and get free shipping over $20. They have competitive pricing for a lot of staples in THM. The promo code is FQM372 if you need it. You can make five pounds of your own sweetener for $32 with my link. These are low carb, sugar free, grain free, gluten free, and a THM S.
Melt 1 bag of Lily’s Chocolate Chips and stir in 1 teaspoon of coconut oil once the chips are melted. Fill each silicone tray cavity half way with melted chocolate and go up the sides with the melted chocolate as well. Place in the freezer for 10 minutes. Meanwhile, mash 1 pint of fresh raspberries in a small saucepan with 2 teaspoons of gentle sweet. Cook over low heat until nice and warm, then stir in 1/4 tsp of gluccomannan, mix well and allow to cool. (I think you can substitute frozen berries but you may need to add more gluccomannan). Remove trays and then fill with filling (about 1/4 to 1/2 tsp depending on size of your silicone cavity), and cover with more chocolate. Place them back into the freezer for 10-15 minutes until solid. Remove from silicone mold and enjoy (they pop out so easy as long as you wait until they are solid). Tip: if your silicone chocolate mold is a different size, you may require more chocolate. Melt 1 bag of Lily's Chocolate Chips and stir in 1 teaspoon of coconut oil once the chips are melted. Fill each silicone tray cavity half way with melted chocolate and go up the sides with the melted chocolate as well. Place in the freezer for 10 minutes. Meanwhile, mash 1 pint of fresh raspberries in a small saucepan with 2 teaspoons of gentle sweet. Cook over low heat until nice and warm, then stir in 1/4 tsp of gluccomannan, mix well and allow to cool. I just added a nutrition box.